100% Cotton Top and 100% Cotton Filled! Dimensions: 54" x 80" x 16"
You need to be awake and alert during your college years so you can make it through your classes and homework and still have energy left to socialize with your friends. But if your Full XL bedding is preventing you from getting a good night's sleep, that awake and alert feeling is going to be hard to get. 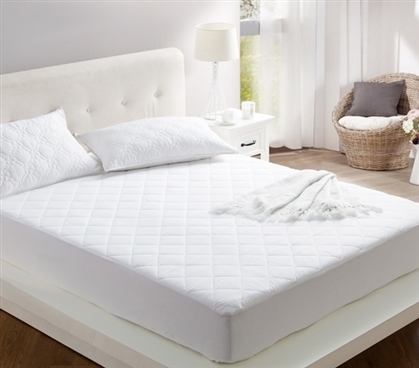 Don't let a potentially uncomfortable extra long Full mattress stop you from getting the sleep you need! Adding on comfortable college bedding like our 100% Cotton Fill - All Around Cotton Full XL Mattress Pad can greatly help you out. Made with 100% cotton inside out like the name implies, this comfy dorm mattress pad will help boost the comfort of your college comforter and the rest of your Full XL bedding. College mattress pads are made to give you an extra layer of comfort, so if your dorm bed is a little shot you don't have to worry about it affecting your sleep. And since this comfortable Full extra long bedding item is made to fit even added depth Full XL mattresses you don't have to worry about any part of your bed not being covered in comfort! A soft and comfy dorm room mattress pad is an essential part of your college bedding that will also create a barrier between you and your Full XL mattress.